Disclaimer: The availability of these tools to the general public does not condone attempts to recover balloon payloads that land on private property, government property, or hazardous locations. 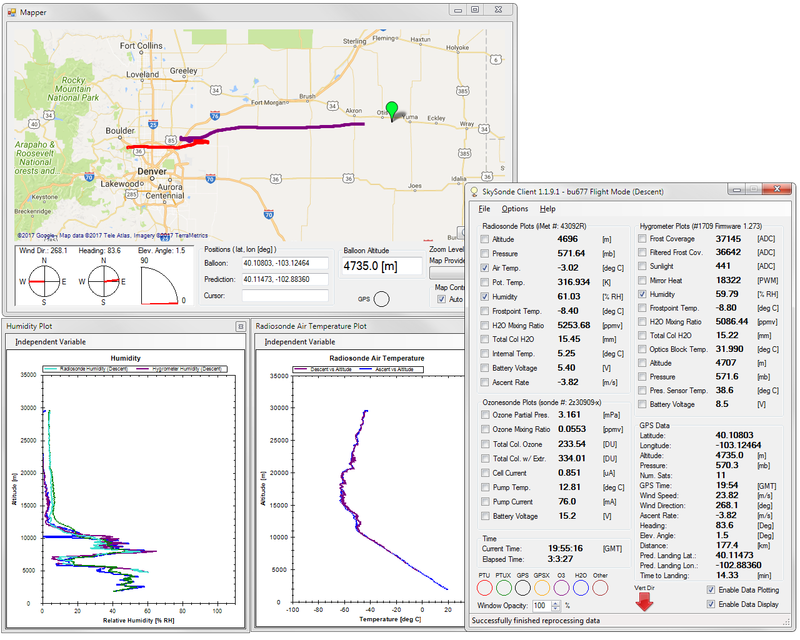 Predicted trajectories and landing zones are only approximate, therefore active tracking is required to accurately locate launched payloads. iMet radiosondes are typically used at 401-405 MHz depending on their configuration. We have a lot of users/technicians in the field unfamiliar with software-defined radio. Walking them through the complexities of SDR Uno / SDR# / HDSDR would be far too difficult, so I decided to write a custom FM receiver directly into my existing SkySonde balloon telemetry software. I wrote it in C# and communicate directly with the driver API to receive I/Q samples at 2 MHz. After some filtering and decimating, I use an FM discriminator to convert I/Q into audio, then filter and decimate some more before passing the result to a software comparator and UART that decodes the Bell 202 signal and assembles full byte frames. Once a complete data packet is received, it is also CRC checked before being used. This has been very successful. 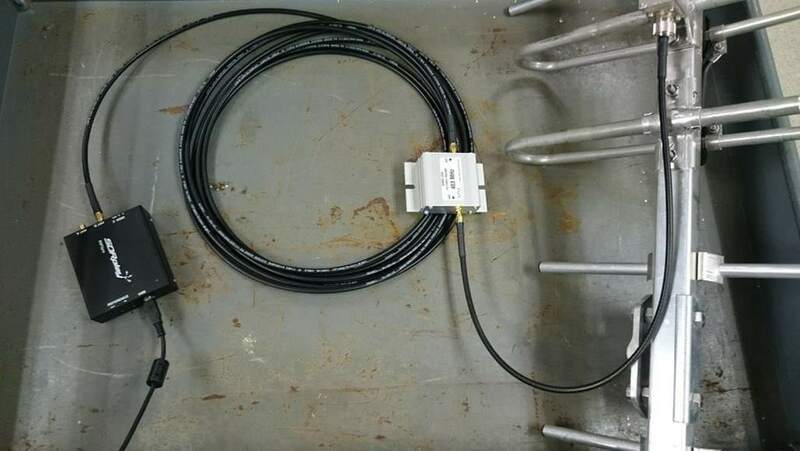 I received a balloon 318 km away with the RSP2 attached to a yagi with preamp, where our old system cut out at 156 km on the same flight. And the RSP2 would have received it longer if the battery on the radiosonde hadn't died. Just one cable between each part thanks to the bias tee power for the preamp. The software download webpage I linked has specifics on parts if anyone is interested. 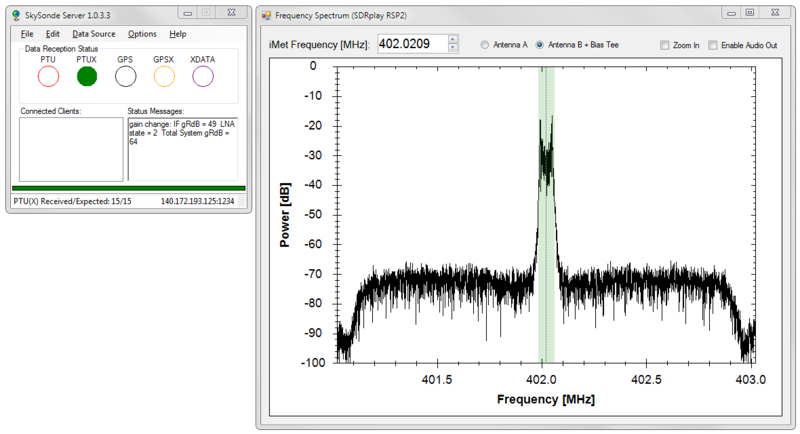 SkySonde also supports RTL-SDR dongles if you manually download the 32-bit rtlsdr.dll from osmocom and move it to the install directory (can't include it directly due to licensing issues). They perform surprisingly well for being cheap, I've received full balloon flights with them too. But they are a lot flimsier compared to the nice RSP2 pro with the aluminum enclosure, and don't have the same gain options and ADC quality. Last edited by bobasaurus on Thu Jan 01, 1970 12:00 am, edited 0 times in total. Thank you for the very interesting post! By chance is there any similar software available to decode the LMS-6 400 MHz radiosondes? K4KDR wrote: Thank you for the very interesting post! Unfortunately I don't have a way of decoding any other type of radiosonde. The Intermet sondes are open protocol, allowing anyone to write parsing programs. Other radiosondes made by Lockheed Martin (who makes the LMS-6), Vaisala, GRAW, Meteomodem, etc are all black boxes that would require serious reverse engineering to decipher. There are a few ham radio programs out there that have partially figured out various radiosonde protocols, I probably can't link them directly. 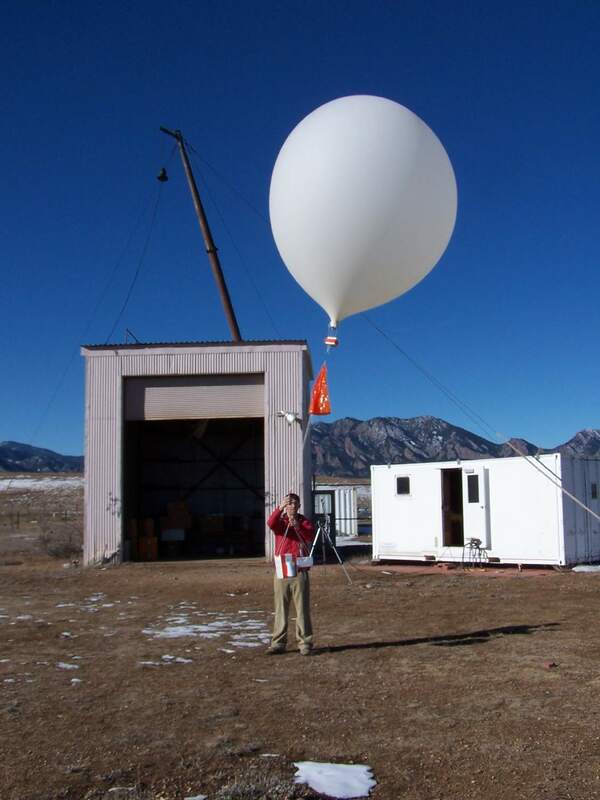 A lot of these other radiosondes are now supporting the XDATA protocol for sending down external instrument data, which was invented by another NOAA engineer. This is great for people (like us) building scientific instruments such as ozonesondes, hygrometers, etc. But the actual radio protocol to the ground is still unknown, requiring the software and sometimes receiving hardware from each manufacturer. Since Intermet radiosondes are open protocol, you can use any antenna/receiver you like and even write your own software if you choose. A cheap 1/4 wave whip with a preamp and any SDR will receive most of a balloon flight. I do have the open source decoding software for the LMS-6 and that gives me lat / lon / alt, but of course it would be fun to see the weather instrument telemetry as well. I've looked at the raw packets and can match up the hex bytes corresponding to all the known data, but the rest of it (that must be weather data) is a mystery. K4KDR wrote: Thanks for the reply! What open source software is that? I might want to try it someday. Your trajectory plotting looks good too. Feel free to use my balloon prediction software on our website (linked previously) for another source of balloon trajectory forecasting. Oh, I just found the German rs1729/RS project, looks interesting. bobasaurus wrote: Oh, I just found the German rs1729/RS project, looks interesting. ... and I use the LMS6 portion under that. ... and if you don't get the output parsed exactly right, adjust the "cut" command as needed. I recently had to do this as something changed in the spacing of the telemetry... perhaps the radiosonde serial numbers increase by a digit or something. I just adjusted the "cut" syntax to get the proper values for Lat/Lon/Alt. Last edited by sounding on Thu Jan 01, 1970 12:00 am, edited 0 times in total.